27th to 28th March 2014, Monaco- CleanEquity is the world’s leading emerging cleantech conference. The conference is targeted at emerging cleantech companies and is designed to deliver access to financial an and strategic investors, potential customers and global media coverage. Following the success of CleanEquity Monaco 2013, the 7th edition of CleanEquity will showcase more of the world's most disruptive next generation companies to a delegation made up of leading financial investors, corporate venturers, strategic acquirers, opinion leaders, policy makers and international, national trade media. Distinguished speakers from renowned institutions will discuss and debate current key issues in the cleantech sector, through a number of plenary sessions and workshops, which will be announced over the coming months. 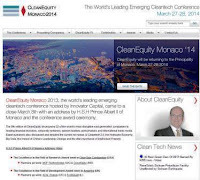 CleanEquity Monaco 2014 will be the seventh consecutive event hosted by Innovator Capital. It has a strong relationship with the Principality of Monaco and in addition to CleanEquity has worked with various governments to support environmental policy and its implementation. Innovator Capital is authorised and regulated by the United Kingdom's Financial Conduct Authority.